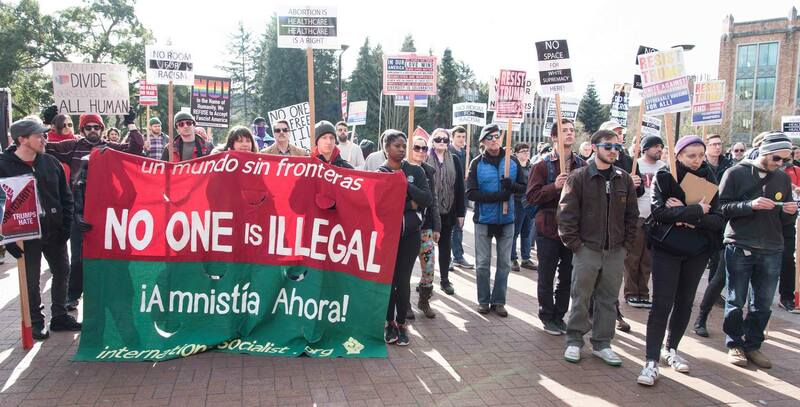 On February 10, the College Republicans at University of Washington held a rally with Patriot Prayer, a right-wing group based in Vancouver, WA. A coalition of left-wing student organizations was created in response, including Socialist Alternative and many others, to organize a counter demonstration. Despite demanding that the College Republican pay for security for the day – there is still a lawsuit pending in regards to this – in the end, the university cancelled a Young, Gifted, and Black event and a body-positive fashion show, as well as closing the libraries and cutting off bus service to the campus for most of the day. The concern that “outside groups” were coming to cause violence at the rally was used by the UW administration to obstruct public access to campus and the student coalition’s counter-demo, not the violent far-right groups who provoked fights with protesters on the counter-demo. It was only the Proud Boys, Patriot Prayer, and Cascade Legion members who crossed the barricades into the crowd of protestors, a clear indication that they were looking to start trouble. The protest began with speakers from the different groups in the coalition outside of the Husky Union Building discussing how to fight the right wing before marching to Red Square where the far right rally was taking place. Socialist Alternative’s speakers called for a mass movement to counter the far-right and drive out Trump, to fight for affordable housing, workplace and campus protections against sexual harassment, and for a new, mass left-wing party that refuses corporate money. These demands were well received by the counter-demonstrators. Police had set up two rows of barricades to keep the groups apart in Red Square. At least 200 protesters showed up, mostly young left-wing students and workers including a large number of masked anarchists as well as the members of the coalition groups. On the other side of the barricades were only a couple dozen conservative rally goers, including members of the Proud Boys and the Cascade Legion, known far-right combat groups. Repeated provocations by Patriot Prayer and the police made for a fast moving situation. Socialist Alternative’s contingent played a positive role in the counter-demo. At one point, large portions of the counter-demonstrators were split up in different areas in Red Square shouting at police while only a minority of the attendees were focused on the Patriot Prayer rally. The chants began to die down and became less organized allowing space for Patriot Prayer to make their speeches. While some activists argued that the coalition should retreat since we had lost control of the crowd, Socialist Alternative argued this would be a mistake. Instead we coordinated with other groups to lead and continue political chants to boost morale and drown out Patriot Prayer. Our contingent made appeals to the different sections of the counter-demo and convinced the majority of attendees to regroup in one area, chant, and focus our attention on the Patriot Prayer rally again. The far-right left shortly after ending an hour earlier than intended and after spending a majority of their time focused on our counter-demo rather than their own speakers. The counter-demo was a qualified, tactical success and shows that when the far-right is challenged when they try to publicly organize, we can disrupt their efforts. Mass action is what’s necessary to successfully challenge and defeat the far-right.